‘We need a rim protector right now,’ Utah coach Larry Krystkowiak says. (Francisco Kjolseth | The Salt Lake Tribune) Matt Van Komen, Pleasant Grove's 7-foot-4 center, pressures Weber during their 6A state basketball tournament game at the Dee Events Center in Ogden on Monday, Feb. 25, 2019. (Francisco Kjolseth | The Salt Lake Tribune) Matt Van Komen, Pleasant Grove's 7-foot-4 center, towers over Weber's Max Triplett during their 6A state basketball tournament game at the Dee Events Center in Ogden on Monday, Feb. 25, 2019. 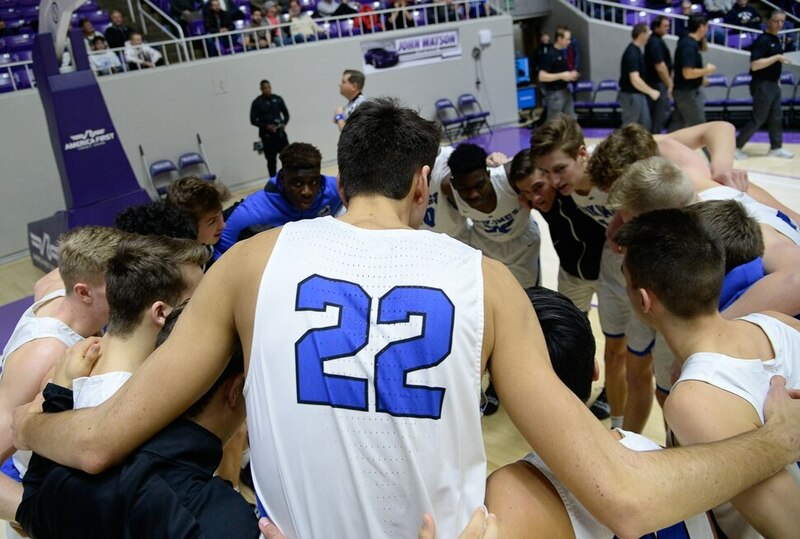 (Francisco Kjolseth | The Salt Lake Tribune) Matt Van Komen, Pleasant Grove's 7-foot-4 center, towers over his teammates as they huddle prior to their 6A state basketball tournament game against Weber at the Dee Events Center in Ogden on Monday, Feb. 25, 2019. (Francisco Kjolseth | The Salt Lake Tribune) Matt Van Komen, Pleasant Grove's 7-foot-4 center, provides the hoop as a teammate mimics a dunk as they are introduced prior to their 6A state basketball tournament game at the Dee Events Center in Ogden on Monday, Feb. 25, 2019. (Francisco Kjolseth | The Salt Lake Tribune) Matt Van Komen, Pleasant Grove's 7-foot-4 center, is joined by teammate Kawika Akina as they compete in the 6A state basketball tournament game at the Dee Events Center in Ogden on Monday, Feb. 25, 2019. (Francisco Kjolseth | The Salt Lake Tribune) Matt Van Komen, Pleasant Grove's 7-foot-4 center, uses his massive wingspan to put pressure on Weber as he competes in the 6A state basketball tournament game at the Dee Events Center in Ogden on Monday, Feb. 25, 2019. (Francisco Kjolseth | The Salt Lake Tribune) Matt Van Komen, Pleasant Grove's 7-foot-4 center, dwarfs his teammates as he rests on the bench during their 6A state basketball tournament game against Weber at the Dee Events Center in Ogden on Monday, Feb. 25, 2019. (Francisco Kjolseth | The Salt Lake Tribune) Casey Brown #3, Tyler Fairbanks #12 and Matt Van Komen #22, Pleasant Grove's 7-foot-4 center, watch their teammates compete in the 6A state basketball tournament game against Weber at the Dee Events Center in Ogden on Monday, Feb. 25, 2019. (Francisco Kjolseth | The Salt Lake Tribune) Matt Van Komen, Pleasant Grove's 7-foot-4 center, expresses his disagreement with a call in the 6A state basketball tournament game against Weber at the Dee Events Center in Ogden on Monday, Feb. 25, 2019. (Francisco Kjolseth | The Salt Lake Tribune) Matt Van Komen, Pleasant Grove's 7-foot-4 center, pressures Weber during their 6A state basketball tournament game at the Dee Events Center in Ogden on Monday, Feb. 25, 2019. (Francisco Kjolseth | The Salt Lake Tribune) Matt Van Komen, Pleasant Grove's 7-foot-4 center, pressures Weber during their 6A state basketball tournament game at the Dee Events Center in Ogden on Monday, Feb. 25, 2019. 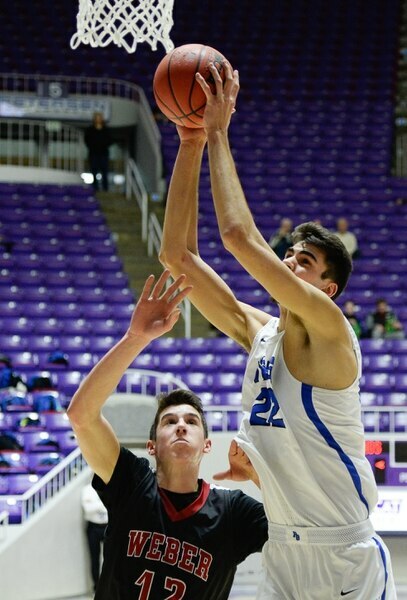 (Francisco Kjolseth | The Salt Lake Tribune) Matt Van Komen, Pleasant Grove's 7-foot-4 center, is joined by teammate Kawika Akina as they compete in the 6A state basketball tournament at the Dee Events Center in Ogden on Monday, Feb. 25, 2019. (Francisco Kjolseth | The Salt Lake Tribune) Matt Van Komen, Pleasant Grove's 7-foot-4 center, warms up prior to their 6A state basketball tournament game at the Dee Events Center in Ogden on Monday, Feb. 25, 2019. (Francisco Kjolseth | The Salt Lake Tribune) Matt Van Komen, Pleasant Grove's 7-foot-4 center, is introduced prior to their 6A state basketball tournament game at the Dee Events Center in Ogden on Monday, Feb. 25, 2019. Ogden • The longest shot Pleasant Grove’s Matt Van Komen made Monday, while he scored 16 points in 16 minutes of a Class 6A state tournament game, came from within a foot of the basket against an opponent nearly a foot shorter. His display of range came at the other end of the court. Van Komen contested a 3-point shot, then turned and hustled down the lane to rebound the ball. The defensive presence that enabled him to block three shots and affect a bunch of others in the Vikings’ 80-57 rout of Weber makes Van Komen valuable to Utah coach Larry Krystkowiak’s program after he signed in November. 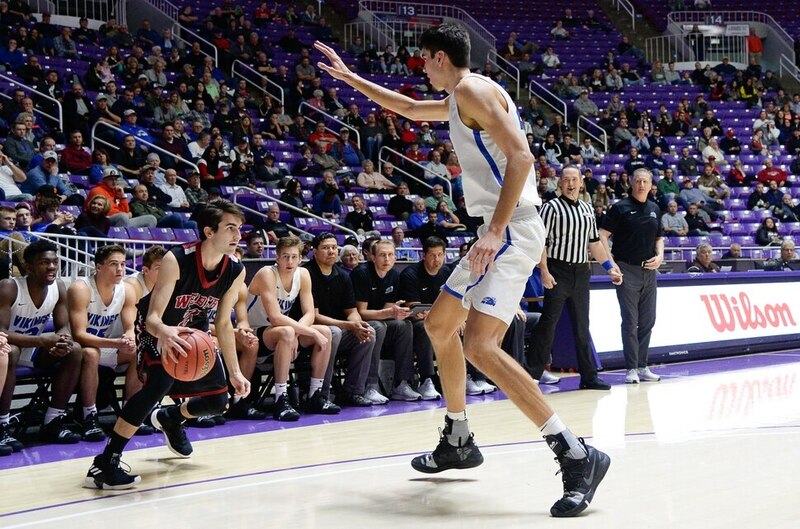 Listed by the Utes at 7-foot-4, he’ll become the tallest player in school history when he arrives on campus this summer, joining a program that needs defensive help. The question is when that blocking would begin. The 220-pound Van Komen needs more strength and weight to thrive in college basketball, so redshirting him in 2019-20 is logical. It would be tempting for Krystkowiak’s staff to play him right away in brief stretches, although current redshirt Lahat Thioune will be available as center Jayce Johnson’s backup next season. Having lost in the state championship game last season at the Huntsman Center, Van Komen is eager to finish his prep career with a title this week. The Vikings (22-2) have lost only to out-of-state teams in a tournament in Hawaii, where Van Komen injured his ankle. In November, PG edged 5A defending champion Olympus, with future Ute guard Rylan Jones, via a buzzer-beating shot. Copper Hills vs. American Fork, 2:30 p.m.
Davis vs. Kearns, 4:10 p.m.
Fremont vs. Riverton, 5:50 p.m. Pleasant Grove vs. Herriman, 7:30 p.m. Whenever he plays in college, Van Komen’s development will be intriguing. The odds of any 7-foot person living in America eventually playing in the NBA are 1 in 6, according to the book “The Sports Gene.” Yet of the 10 7-footers in Ute history (counting Johnson and senior Novak Topalovic), only Andrew Bogut and Jakob Poeltl have played in the NBA. David Foster (7-3), who blocked 99 shots for Utah in the 2010-11 season, may provide the baseline comparison to Van Komen's potential. Van Komen, who's averaging 13.0 points, 8.6 rebounds and 4.8 blocks, runs well and has good hands. He throws sharp passes and has excellent timing for blocking shots and turning rebounds into dunks, in one motion. “When he's healthy and he's playing every day, his development goes straight up,” McAllister said. McAllister plays him in four-minute stretches, resembling the college game's flow with media timeouts. That area of the Huntsman Center court needs Van Komen’s presence, whenever gets there.